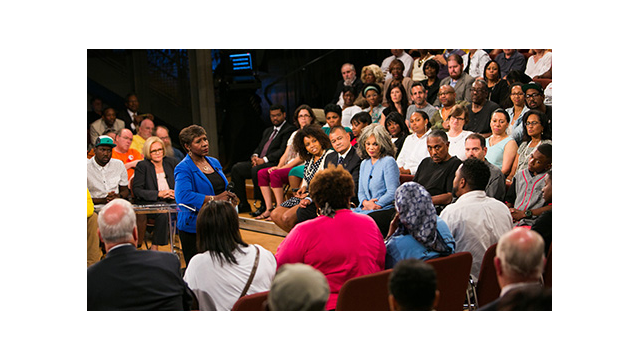 ARLINGTON, VA, September 24, 2014 -- PBS today announced additional details relevant to its special broadcast of AMERICA AFTER FERGUSON, a one-hour town hall meeting exploring the many issues brought into public discourse in the wake of Michael Brown’s death in Ferguson, Missouri. Moderated by Gwen Ifill, PBS NEWSHOUR co-anchor and managing editor and moderator and managing editor of WASHINGTON WEEK, the town hall meeting was held Sunday, September 21, on the campus of the University of Missouri-St. Louis with an audience of more than 400. The program, produced by WGBH Boston in partnership with Nine Network/KETC in St. Louis and WETA in Washington DC, airs Friday, September 26, 2014, 8:00-9:00 p.m. ET on PBS (check local listings). To help foster a national dialogue, PBS and its member stations will, for the first time, incorporate live tweets during the 8:00 p.m. ET broadcast of AMERICA AFTER FERGUSON, as well as the West Coast feed at 11:00 p.m. ET. Viewers will be encouraged to use the Twitter hashtag #AfterFergusonPBS to join the conversation and to have their tweets considered for inclusion in the broadcast. • What kind of America did Ferguson reveal? • What is the relationship between communities of color and law enforcement? • How do we speak about race? How do Americans see themselves reflected in stories like Ferguson? WGBH Boston is America’s preeminent public broadcaster and the largest producer of PBS content for TV and the web. Television channels include WGBH 2, WGBX 44, and the digital channels World and Create. WGBH Radio serves listeners across New England with 89.7 WGBH Boston’s Local NPR®; 99.5 WCRB; and WCAI, the Cape and Islands NPR® Station. Find more information at wgbh.org.